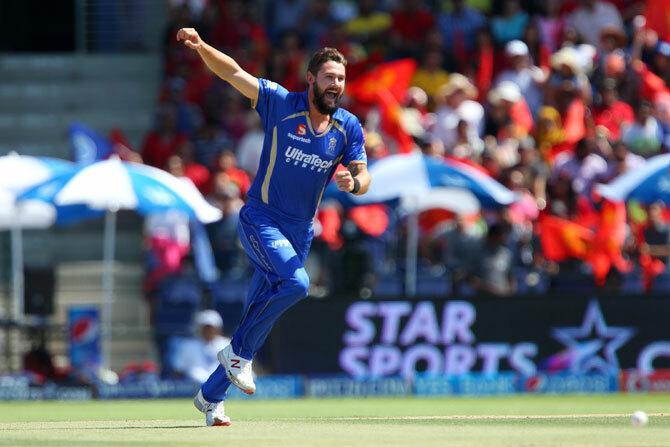 Rajasthan Royals beat Royal Challengers Bangalore by six wickets in their IPL match in Abu Dhabi on Saturday. 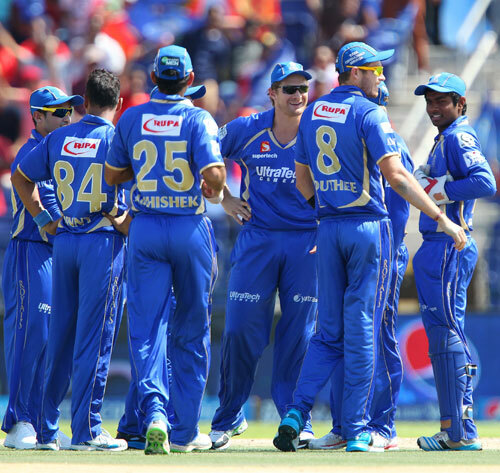 Bangalore were bowled out for just 70 and Rajasthan reached their target with seven overs left. A star-studded Bangalore batting line-up collapsed like a pack of cards as they were shot out for a paltry 70, their lowest IPL otal. Ironically in 2009, Rajasthan were at the receiving end of Bangalore's hostility when they were bundled out for 58 - the lowest IPL score by any team till now. Kane Richardson comes in place of James Faulkner. Bangalore surprisingly drop Varun Aaron to bring in Ravi Rampaul while Sachin Rana comes in for Muttiah Muralitharan. Medium-pacer Stuart Binny got Yogesh Takawale caught behind for nought and the in-form Parthiv Patel followed him soon after being run out for one. Australian pacer Kane Richardson then replaced Binny in the third over to choke the Bangalore top order after picking up the prized wickets of Yuvraj Singh (3) and AB de Villiers (0) on consecutive deliveries. The hat-trick ball was foiled by Sachin Rana. Pravin Tambe (4-20), further justified his skipper's decision to bowl first as only three Bangalore batsmen could touch a double-digit mark. Tambe got Albie Morkel for seven, having the South African caught by Steven Smith at mid-off. He then had Bangalore skipper Virat Kohli (21) caught by Tim Southee at mid-off. 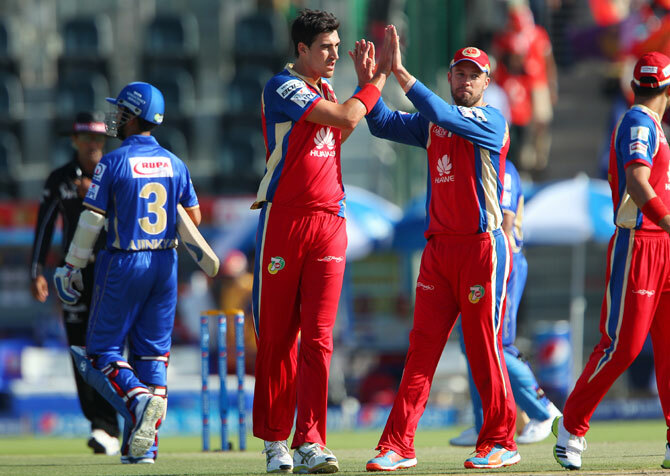 The procession continued as Mitchel Starc (18) was caught by Binny off Rajat Bhatia after a fighting 18. Tambe then completed the formalities to wipe off the tail. Tambe deservedly won the man-of-the-match honor for his effort. Chasing 71, Rajasthan hit a few roadblocks when Ajinkya Rahane was caught behind off Mitchell Starc for 23, Sanju Samson (2) was run out and Starc struck his second blow to send Karun Nair - also caught behind - back for eight. The Australian, who bowled all his overs on the trot, finished with figures of two for 29. The two wickets helped Starc take sole possession of the purple cap. Leg-spinner Yuzvendra Chahal also picked up a consolation wicket when Shane Watson was caught at cover while trying to finish the game. 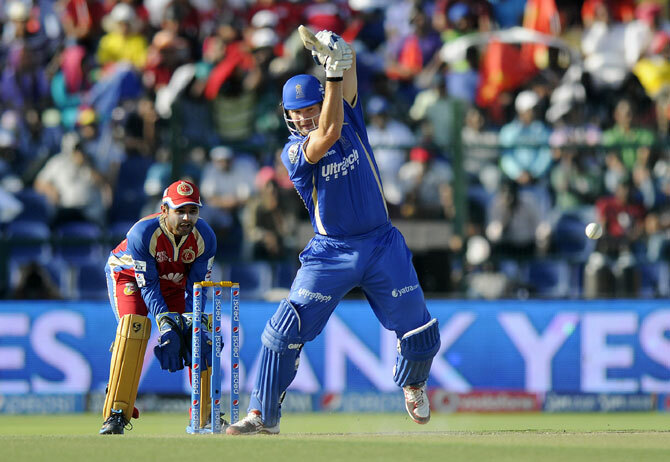 Shane Watson, the Rajasthan captain, top-scored with 24 runs. Watson's innings was inclusive of a boundary and a couple of sixes, both off Yuzvendra Chahal. 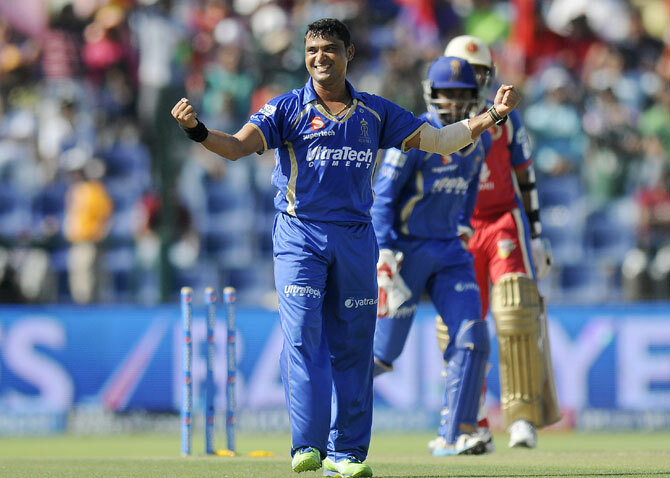 However, he fell to the spinner with Rajasthan needing just three runs to win. It was left to Abhishek Nayar (11 not out) to hit the winning runs to give Rajasthan their second win in the tournament after four games.